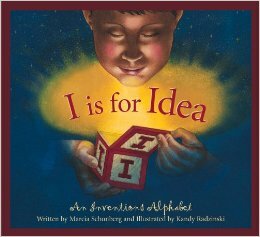 With Marcia Schonberg’s I is for Idea: An Inventions Alphabet, students started researching their ideas too. Marcia is the author of many alaphabet books, like B is for Buckeye. Through poetry and intriguing facts, readers are engaged by her works. Students selected a topic, used the Dewey Decimal System, located resources, and are recording information for their own personal alphabet book. Let’s be creative and publish our own version of this book. Find a topic/objects you want to research. Find a fun fact about each one. Write the fun fact you learned for each letter of the alphabet.